Only the Name Has Changed? A new sponsor and the same amazing event. 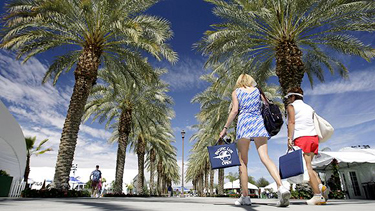 For a while there it looked like they'd just have to call it plain old Indian Wells in 2009, but now the tournament has a new sponsor and a new name. We've gone from a big insurance company to a big bank, and a French bank at that, with the motto "The Bank for a Changing World." And who knows what that may actually mean, but we can hope for the best. So now it's the BNP Paribas Open. (say "par ee baa"). Click to see the website--it's in French! (Click Here.) They already sponsor another Masters Series event, the one in Paris in November, so that seems like a good sign. Then again who thought Citibank could go from $55 to $1 a share? But the bottom line, it's fantastic to see a new major corporate sponsor--because I want to keep coming to this event for a while longer. backgrounds, like the BNP logo. So how will the event change? Well, the one thing that will be different for sure is all the signage around the courts - and therefore all the backgrounds in future Tennisplayer videos. (I'm kinda hoping for a nice deep green, like the bank logo). But unless something else really, really strange happens it'll still be the best 10 tennis days of the year, or something close to it, at least from my perspective. By the time you read this I will no doubt be bombing (or have bombed) down Interstate 5 from San Francisco, then made a left on Interstate 10 and headed east all the way to Indian Wells - unless I decide to cut through the high mountain plateau at Gorman and look at gorgeous giant Joshua trees and other bizarre desert plants, massive rocks, abandoned buildings, plus some tract mansions and strip malls - always a possibility. It's about 500 miles total. Interstate 5: the path south to Indian Wells. People tell me I am crazy because I drive, but I say if you fly you're the crazy one. Think about it! It takes a half hour or more to get to the airport. You are supposed to be there two hours early, and they take away your contact lens solution bottle at security. The flight to Palm Springs is an hour and fifteen minutes, if it's on time. (Not that likely from San Francisco.) It takes 45 minutes to collect the gear and get the rental car. And then it's still 30 minutes from the Palm Springs Airport to the Grand Hyatt in Indian Wells. So that's about 5 and half hours, assuming all goes according to plan, which is an unreasonable assumption. And who knows who you might have to sit next to on the plane, anyway? Yuck. Plus I get to worry about all the expensive video and camera gear I had to check, at not insignificant additional costs. 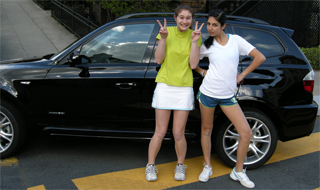 Not to mention having to drive some bad Japanese SUV for the week once I actually get there. Those who know me know that I have a fondness for black, and that's when it comes to Fila tennis clothes and BMWs, among other things. And as luck would have it, just last month I turned over the lease and got my brand new BMW X3 in time to make the trip. And for you ecoheads, it gets 25 miles plus to the gallon so long as you keep it under 90mph. And yeah if BMW makes a hybrid, or better, a commercial hydrogen version, I'm there. Blythe and Layla, University High School championship teammates. So when I get to Indian Wells we'll have that gorgeous black X3 as the official Tennisplayer.net transportation vehicle, always a plus. And don't think people in the media parking lot don't notice who is driving what. They treat you nicer at the valet parking at the hotel too, especially if you tip lavishly when you arrive. That's critical when you are trying to make it to dinner and there are 10 mean looking middle aged couples who think they should get their cars first. I also have a serious thing for the visuals in the Central Valley along Interstate 5. If you don't know the valley, it's very flat, very wide and very long - 250 miles. The water flows down from the north by canal, and they grow some huge percentage of all the produce eaten in the every state in the union right there on either side of the highway. Plus quite a few of the steaks. If you've never driven it all the way and then up over the Grapevine - the curvy, treacherous road over the mountains that separate the valley from the greater LA area, I say it's a must. Not to mention the giant windmill farm just outside of Palm Springs. The strange, changing beauty of the central valley viewed from the road on Interstate 5. There is a harsh beauty to it and the colors in the hills, earth, and sky are different every time. You've got the gigantic moving weather fronts, hundreds of rows of various agricultural plants, massive orchards. The colors run from golden brown to bright green to white with some yellows and reds thrown in. Then when the light is right things turn purple and blue. When something looks especially spectacular or bizarre I like to pull off and take landscape photos. If you come over the office in San Francisco, some of them are on the walls. Watch out for the California Highway Patrol though if you try to take a picture from the shoulder of Highway 5 though - they don't like that. So me, I'll just be sitting there in that ergo leather seat, enjoying the long straight drive (except for that one left turn), watching the sky in the valley, listening to the Ipod, maybe catching up on a few phone calls with old friends you don't normally make the time to call. (Yeah, yeah, hands free.) Stopping and finding some small weird café to eat it in. Maybe collecting a few random rusted objects from the side of the rode or a junk/antique store for my wife to use in one of her mixed media art projects. It might take me 8 or even 9 hours total - but to me so much more than worth it when compared with so-called "modern air travel." Robert Lansdorp: Would you want this man interrogating you? So does this article have anything to do with tennis whatsoever? Uh, I did start by saying the name of the tournament had changed and I expected everything else to be as amazing as usual. But if you've read these articles I been writing about the event for the last few years, you know every year has its surprises. 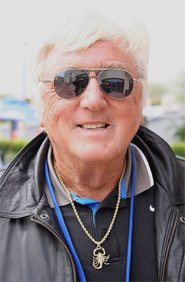 This year Robert Lansdorp is coming as an officially credentialed Tennisplayer correspondent, although he gets a kick of telling people he is actually representing the Dutch Free Press. He claims he's going to go to a lot of post match interviews and make the players really uncomfortable with some intense, aggressive questions. I can't wait until the idiotic general tennis media (did I say that?) experiences that addition to their presence. But then again maybe he'll be nice. That's what I like about Robert, he's unpredictable. And then there are the players themselves. 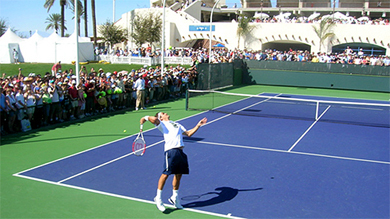 Over the years, we've filmed a lot of great players in depth at Indian Wells: Agassi, Sampras, Federer, Henin. And this year we'll continual that, developing archival footage of as many new players as possible. Our stroke archive is unsurpassed, which you already know if you are a subscriber. There are almost 40,000 clips of about 70 of the best players in the world, but it is always a work in progress so we can keep up with the game - and help you do the same. One of the things I'm proudest about on the site is this massive, living data base that gives us all the opportunity to continue to study and learn. I get lots of requests (sometimes rather agitated requests) to see certain strokes from certain players from our subscribers. It's what I call the "magic bullet" theory. "If I could just see Giles Simon's forehand (or whomever) then I could really take my game to the next level." And, as I have (patiently) tried to explain, it's not really like that. There is no magic bullet. A chance to film new top players like Tsonga, Del Potro, and Simon. It's more about the technical commonalities between the players - and studying them to see how all he variations in grips and swings interact and play out, not finding some "secret" in the stroke of anyone player. It's the larger patterns that matter. Because you won't find one player with one stroke with some radical biomechanical difference that no other human body has been able to develop or execute. New women for the Stroke Archive could include Wozniacki and Safina. So I'm hoping we will get a chance to film players like Jo Willie Tsonga, Juan Martin Del Potro, Dinara Safina, and yeah, even Giles Simon, young players who are in the top 10 and have already made names for themselves. But we'll also be trying to catch a lot of other fantastic young players who are less well known and might be at the next level in the near or immediate future. 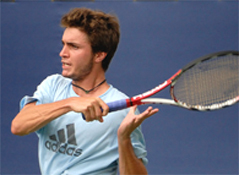 Players like Marin Cilic, or Ernests Gulbis, or Caroline Wozniacki. Or maybe some player who makes it up through the qualifying that no one has really heard of yet. I remember having that experience filming a young player named Roger Federer on the outer courts at Indian Wells, though that has been a few years ago now. Federer shows off for his fans on the awesome practice courts. Which brings us to the absolute best aspect of the tournament, which is the incredible visibility of the players. If you've been to the Open you know how tough it can be on the outer courts. Once you get a seat, you can't move - because even if the player you really want to watch just started on another court, it might be an hour wait to get a spot there. It's not like that at Indian Wells. It's easy to move around between the three stadiums and the outer courts. And the practice courts are set up like a dream. Roger stays at La Quinta now, and he could practice quietly there, but he still comes over to put on a show at Tennis Garden and sometimes I think the fans enjoy watching him work out more there, than they do watching his early round matches. From our point of view covering the event, it's the same. As media we get to eat in the dining room with the players, which gives you the chance to vibe the personalities and watch the players interact among themselves in unguarded moments. And yeah, when Rafa or Roger come in, a palpable hush falls over the room, for a second anyway. A chance to show my Jelena serve analysis to her coaches? 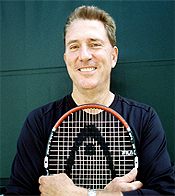 Hopefully I'll get a chance to hook up with my old friend Craig Cardon as well, who did an incredible job coaching Martina Navratilova when she was at the top. Now Craig is with Ana Ivanovic and I predict you are going to see something really positive happen there. Maybe Larry Stefanki wants to see some footage of Andy Roddick's backhand - no, no one I've heard talk about it in the media has accurately described the problems there. Study the stroke clip for yourself and see if you see what I see. Study Andy's backhand for yourself and send me your thoughts! And then there is the desert life style experience. The Tennis Garden itself is gorgeous. Wide open, minimalist, but at the same time beautifully landscaped, with a lot of green grass and native desert plants all mixed together. Same basic concept as the hotels and the surrounding desert community. Le Vallauris, the team's new find: old style French with a tree covered patio. And then there is the fine dining. If you've read my pieces as we have traveled around, (Click Here to see the one from Wimbledon last year), you know that my friend, traveling companion, and Tennisplayer digital still photographer, J. Gregory Swendsen believes that a fine meal (and some fine wine) have religious significance - both for him and his dining companions. At Indian Wells, we've found some amazing places tucked in various corners of the desert and last year we added a new favorite that went to the top of the list or close, LeVallauris. (Click Here.) It's an amazing old style French restaurant in old, downtown Palm Springs. 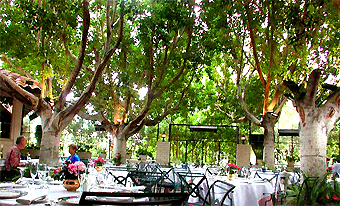 The center piece is the outdoor courtyard with trees forming an overhead canopy. It was a hit with the entire team last year. And they'll be back again, filming all day and trying to match J.Greg glass for glass at night. (A difficult challenge.) Susan Kraft, our other great still photographer. And on video, Giancarlo Andreani and Matt Barrett. And my job is to research the next great place to dine. I have to find one great new one every year. Yeah there is a lot of pressure in leadership. So that's the plan. Except that I know they'll be some unexpected twists. Usually we run into a few interesting people along the way - old friends, or new ones we make. So if you're there and you see some guys running around with video cameras and you're pretty sure it's us, come up and say hi. There is still time to book a plane ticket, or better yet have the Interstate 5 experience for yourself. And if you don't make it, our partners the Tennis Channel are covering that first great weekend, almost minute by minute. Be sure to look for the Tennisplayer.net ad while you're watching.